If you've got to clean your home, then why not use aromatherapy for the same purpose as well? Along with the sparkling cleanliness aromatherapy for household products can provide, you can also enjoy the great fragrance in your house when you use these products. 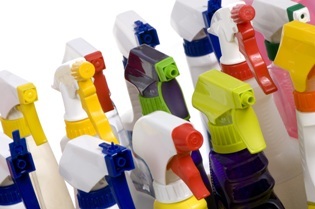 Cleaning is not an easy task and for those of you who has done it you know that there are A LOT of products that are laced with fragrance substances that at times comes too strong. If the house does not have enough ventilation system it will cause the odor to be so dense and may be qualified suffocating. These smells are seldom pleasing and sometimes even cause a sick feeling, and this is because of all of the blending of strong and sometimes toxic chemicals. Aromatherapy for household products on the other hand are safe to our environment and as already mentioned leave a pleasing fragrance when used, as well as having more natural blending and combinations. Using essential oil-infused products will make cleaning a pleasant experience than just another ordinary routine you have to do minus the suffocating feeling brought by overwhelming scent of fragrance substances. It will be cheaper if you make your batches in larger amounts. Label them with the ingredient and the date that you made it, to avoid confusion. Store these products away from children, as they can be harmful if ingested in large doses. Remember to use them as per instructions alone. Even though they're non-toxic, ingestion of excessive quantities can cause sickness. Always keep essential oils away from the eyes, as they will irritate them. If you’re looking to freshen the air inside your home, put your favorite scent into a pot of water and simmer this mixture on the stove-top for several hours. The smell of citrus would be a great choice for this purpose, but of course you can choose your favorite oils as there are many essential oils out there to choose from. To ensure there's always a fresh scent in the bathroom try squeezing a few drops of essential oils onto the cardboard roll that holds the toilet paper. The fragrance will release with each pull, but make sure to do this with every new roll! If you want to use chemical-based cleaning products but prefer to have a lingering fragrance that doesn't smell like harsh chemicals, then rinse the house with a combination of water and essential oils. Otherwise use the standard aromatherapy methods for household cleaning and freshening, if you feel comfortable doing so. Lemon, Eucalyptus, wintergreen, lavender, pine and many other essential oils are perfect for use in your household cleaning activities. For the previous mentioned essential oils it is advised to dilute four drops in a pint of water. This mixture may be applied with a sprayer that gives off a fine mist allowing the air to carry the molecules for a longer period of time. Note that you need to store these items in a place that is cool, dry, and not well-lit because light may cause the essential oils to lose their valuable properties. To highlight, tea tree and lavender essential oils have antimicrobial properties that makes it as an effective cleaning component. With this notable characteristic it is perfect for cleaning and air freshening. Molds and mildew are some of the hardest household problem to battle. With lavender or tea tree essential oils you can just add up to 50 drops in a bucket of water and you are good to go. Mix 4 cups of cornstarch or baking soda with 25 drops rosewood essential oil, 35 drops of eucalyptus essential oil or 30 drops lavender essential oil. Combine the ingredients and make sure that the solution is uniform and no lumps are left. The mixture may be mixed in a shaker bottle and the product be used on carpets. The carpet must be applied 15 minutes before vacuuming. You can also customize your own mix of essential oils based on your preference. In 1 gallon of hot water, combine 8 drops of lemon essential oils and 15 drops of orange essential oil and add 2 tablespoons liquid soap into the mixture. This mixture will work on tough jobs and will leave the room smelling fresh, while allowing you to try using all natural essential oils. Make your own dryer sheets by adding the essential oil-laced towel into the dryer with the rest of the other clothes and dry as you would normally do. Place lavender essential oils into a spray-bottle. Lightly put these essential oils linen mist spray to bed sheets before retiring for the night, and they will absorb the wonderful scent. More blend for aromatherapy for household cleaning and freshening. Making your own Aromatherapy Air Freshener can be fun and easy. Back To Basics Natural Cleaning - Learn how to create your own natural cleaning products using safe, non-toxic ingredients, plus tips, facts and advice on healthier ways to clean your home. Check out AromaLiving#001 to see How Healthy is Your Home?